As you probably know by now, I'm a very new cook that just started cooking back in July. I know it is difficult to believe that someone could live 26 and a half years and not know that packs of chicken can be kept in the freezer until needed, or that Carrie Bradshaw actually sounded crazy, not helpful, when she offered the "sweater in the stove" tip. So now that I've been working at this cooking thing for a few months, I realize I've got a problem to deal with, and I have yet to see Pinterest offering up any solutions. Jerks. 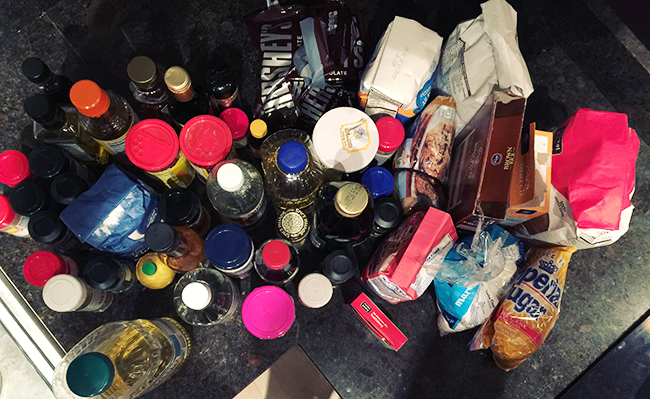 Problem: I keep buying items from the grocery store I already own!! I am not a Sunday-afternoon-shop-for-the-whole-week grocery shopper. Sunday afternoon is for Football (insert all of the tears here now that football is over), not fighting the crowds at Kroger. I also think a telltale sign of a new cook is that they only shop one meal at a time. My dad used to be the same way. I know all you meal prep people are gasping at how horrific I am right now, but I'm very new at this. At this point in time, I feel most comfortable finding a recipe on my lunch break at work, going to the grocery store on my lunch break for that one meal, then preparing the meal that night. Plus, when you have a boyfriend that lives 45 minutes away from you, grocery shopping for a full week is easier said than done. This method just works for me. 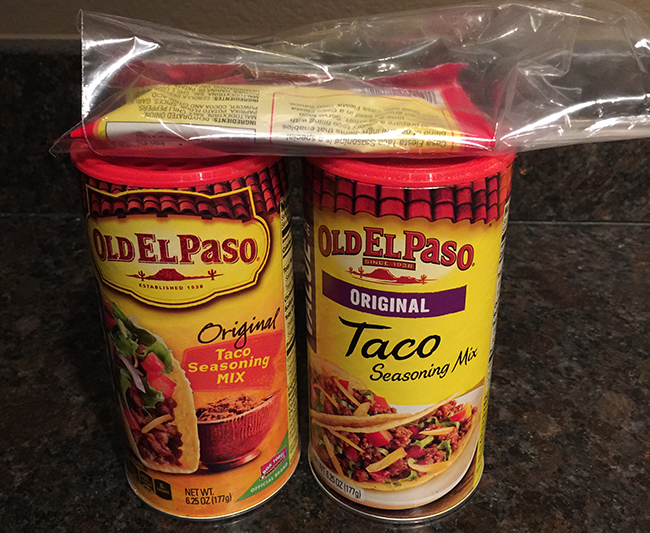 I could be the only person in the world who cooks like this, but in the event that I'm not, here is my plan of attack to remember what I have in the pantry, and to stop buying duplicates. 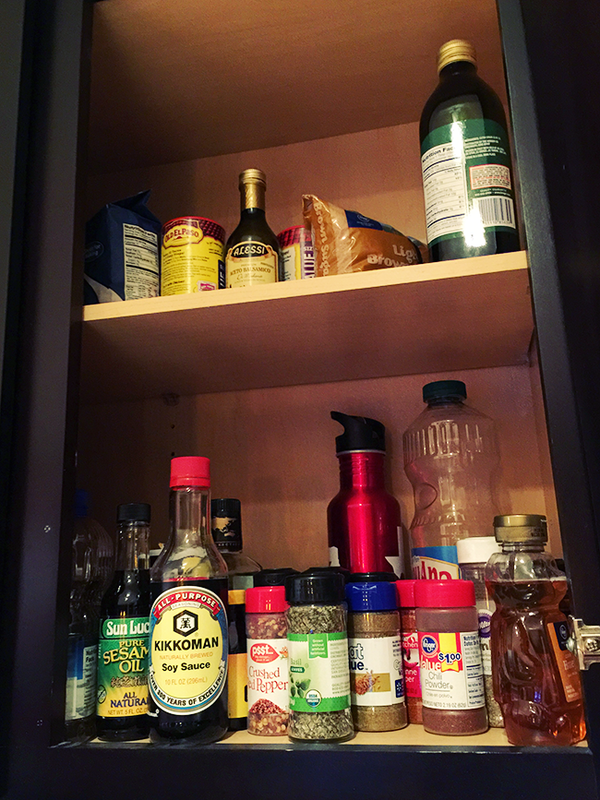 Last night I dumped out my spice cabinet and pantry on to the counter, so I could organize and take inventory of what I owned. 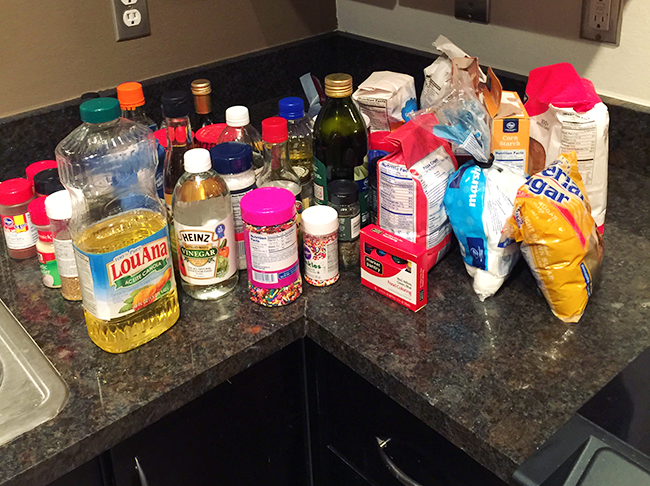 Then I separated out each ingredient how I wanted them grouped going forward. So for me that meant spices, baking, oils and then other random liquids in bottles. As you can see, I have a lot of duplicates. If my neighbor anyone in the Metroplex needs sugar, I'm your girl. 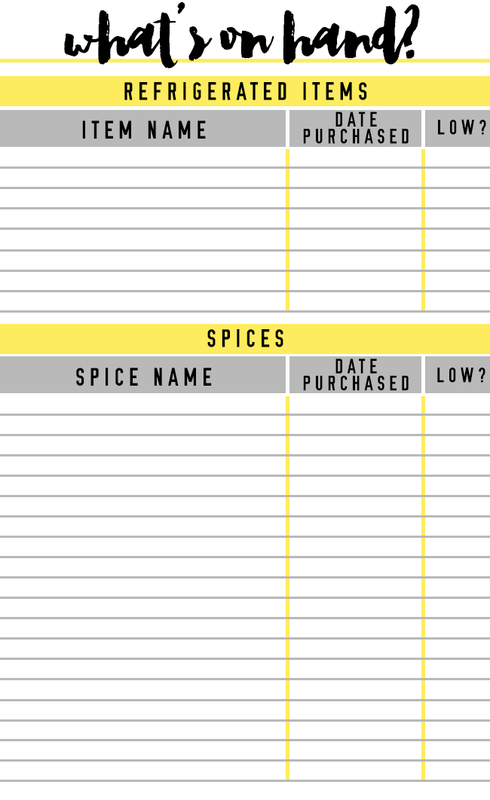 After sorting out what I owned, I then wrote down each item on a printable I made that fits into my planner. 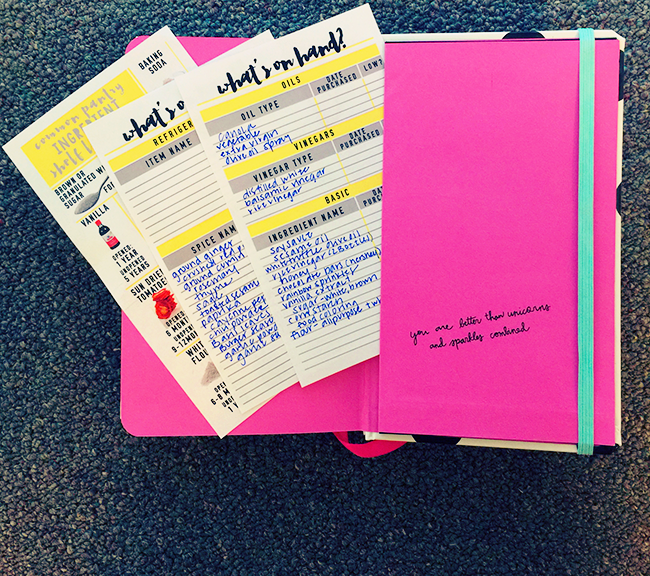 I never go anywhere without my planner, especially during the work week, so I really think this will work great for me. 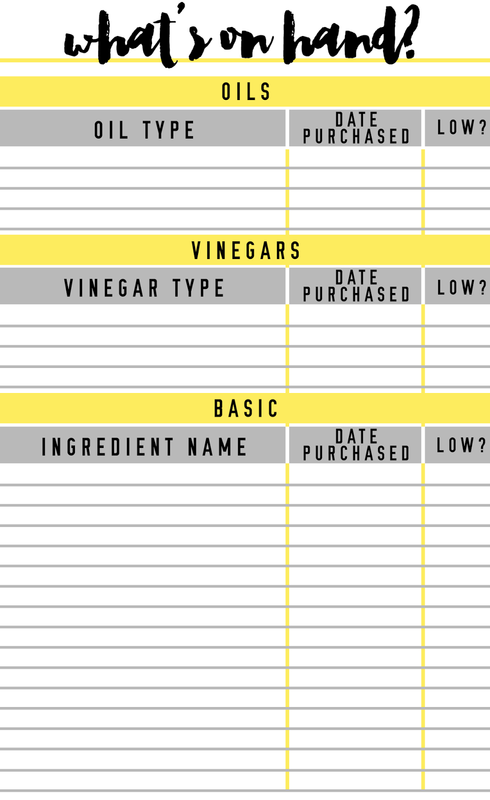 I also made a sheet that fits my planner that has the shelf life of some common ingredients. 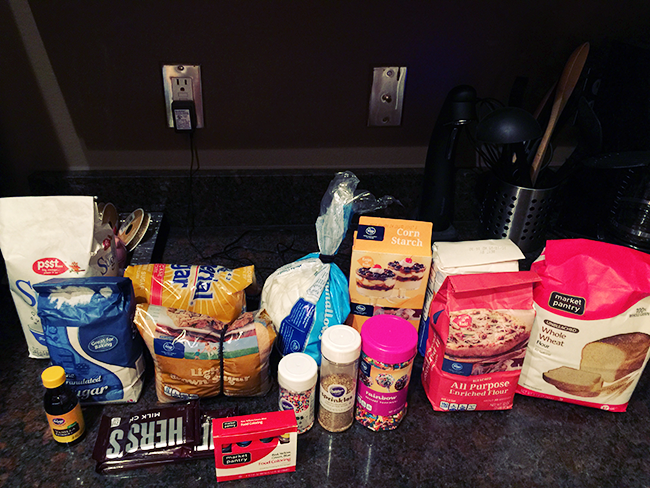 I also took pictures of the ingredients for two reasons. Reason one, this blog post of course. 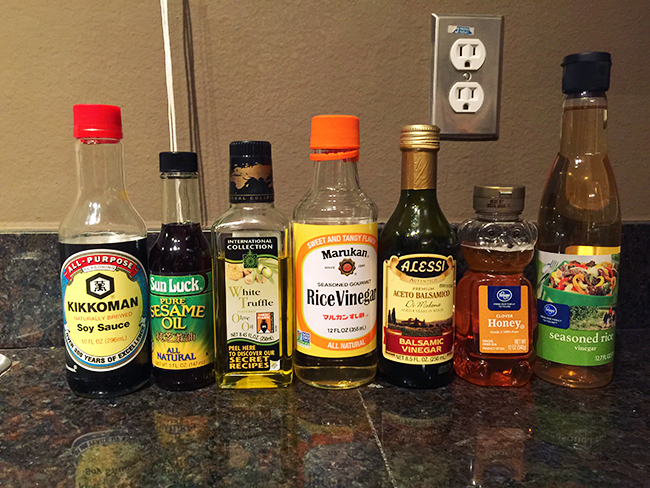 Reason two, so I could create a photo album on my iPhone with pictures documenting what spices, oils, vinegars, etc. that I have at home, in the event I don't have my planner with me while I'm shopping! So hopefully this will help me, and I would love it if it ended up helping you too. 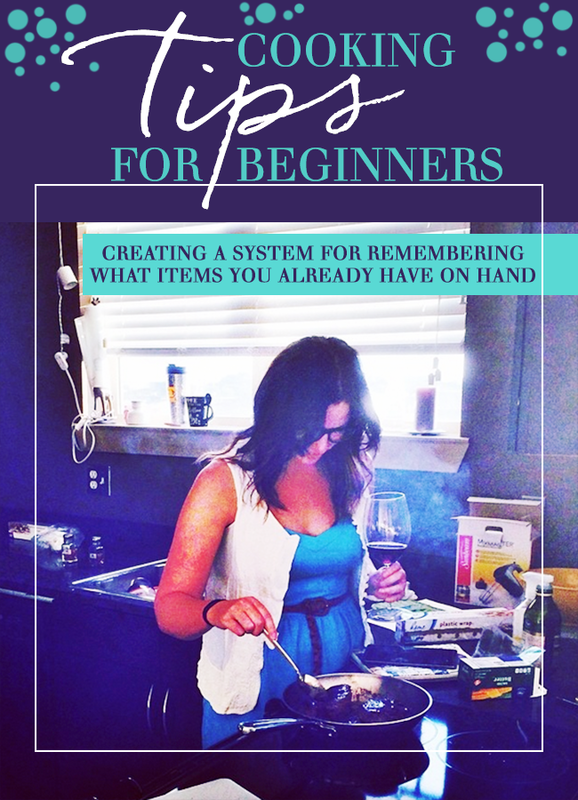 Are you a once a week grocery shopper or do you go more often, like me? What obstacles do you face when cooking? Today I have Alison from Puppies and Pretties taking over with a Game of Thrones Drinking Game. Ok so I hate to say this, but I've only watched one episode of Game of Thrones. But because so many of my friends tell me it is one of the best shows on TV, I'm fairly certain I am missing out. I told Alison that I think a drinking game was the exact excuse I needed to give GOT another chance, and start right from season one, episode one! 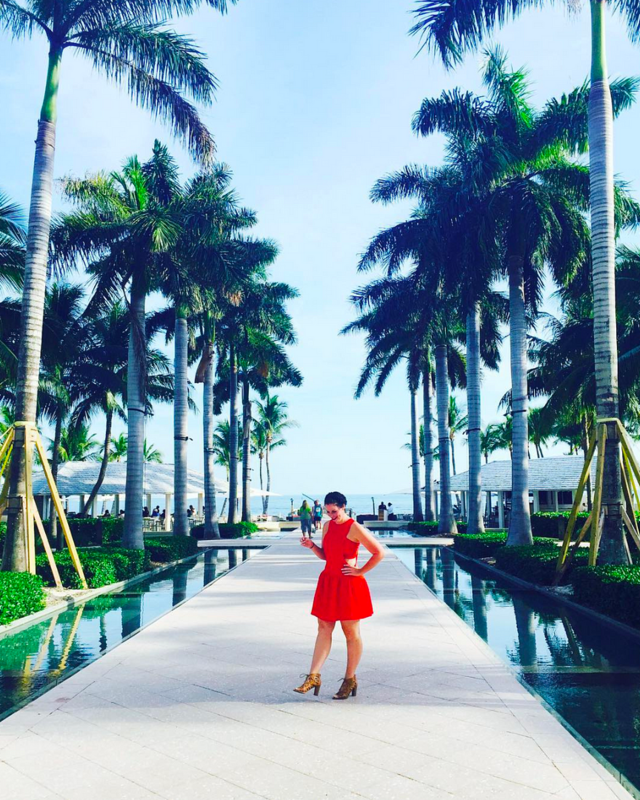 Hello VTIM readers! Alison here and I blog over at Puppies & Pretties. While I focus on style for the most part, I'm still a major nerd and that side of me comes out every once in awhile. And if there is one thing that I really geek out on, it is Game of Thrones/Song of Ice and Fire (the book series that it is based on). Since Season 4 is coming out on DVD on February 11th, I thought I would put together a drinking game to get you ready for catching up on seasons 1-4. Season 5 starts on April 12! Yay! Now to the game! Someone says "Winter is Coming"
Someone says "A Lannister pays his debts"
Arya says "I'm a girl!" Want to geek out on GOT with me? Come and visit! I'm actually going to start going shopping for 1-2 meals instead of the big meal prep thing, so I guess I'm doing it backwards! I used to love cooking a few years ago when I had a live-in boyfriend (that bought all the expensive groceries...) but since I've been single, I waste so much food and hate making big meals just for me. Now that I have a new-found guy interest (he's not my "boyfriend" technically so I don't know how the hell to title him), I want to start cooking again, but he and I make last minute plans to see each other all the time so I end up wasting food. That's why I think I'm going to start finding one recipe, going to the store and getting the stuff and then making it. If I start to run out later in the week or start cooking for him (which he's all for), I'll go back with another recipe. I'm hoping that'll help me not waste so much food! Oh, and I'm with you on the sugar thing. Why do I have absolutely nothing in my fridge except wine and pickles, yet I have what seems like 17 bags of different kinds of sugar?! Um I've been cooking for years and I still buy duplicates OR I assume I have it and then get really pissed when I don't so this is GENIUS! THANK YOU! This is a fantastic idea. I too only shop for 1 meal (maybe 2 meals if I'm feeling crazy) at a time. Life is too hectic for me to plan and buy ingredients for meals because half the time something comes up at work and I have a pound of chicken rotting in the fridge before I can use it. I think I currently have 2 - 3 duplicate bottles of soy sauce, olive oil and salad dressing because I never can remember what I have in the fridge/pantry. My husband and I are backwards as well.. only shopping for maybe 3 meals max (dinners) our whole shopping experience revolves around his pay day and mine (I am Wednesday he's Friday so we shop Wednesdays and Saturdays). That being said we have staples and I TRY to keep track of it. 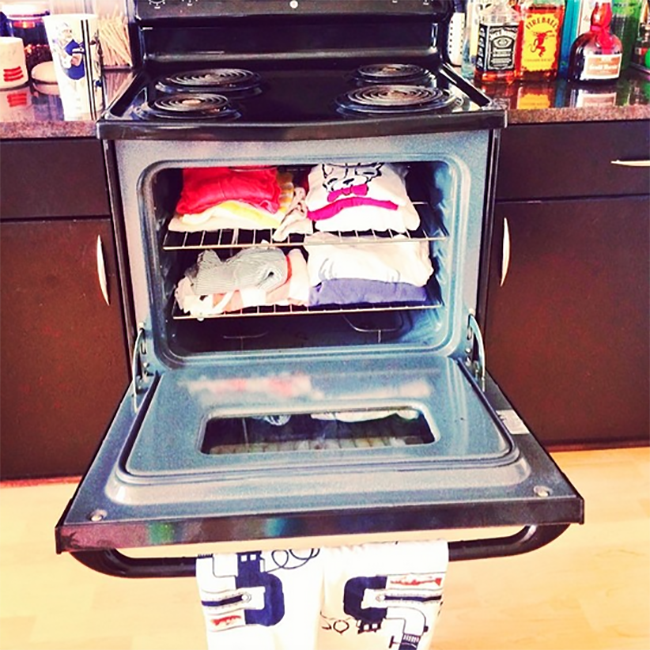 I love this organization idea and the slips you made!!! SO smart! I definitely need to print out those and put them in my planner! My problem is that my food goes bad before I end up using it and I hate going to the grocery store every week. Struggles. I always end up with duplicates. 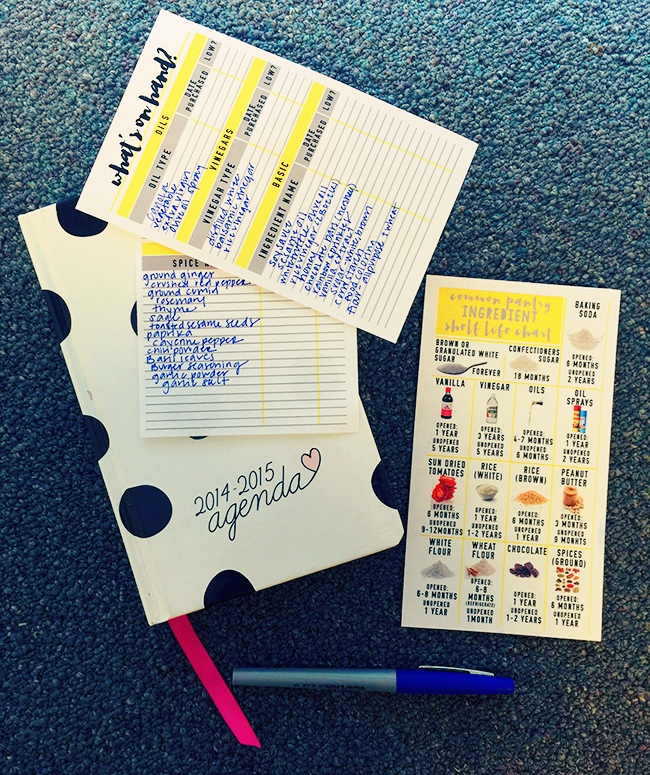 Your printables are super cute. One question though, who has unopened chocolate for longer than 5 minutes? I always end up with duplicates to. So now I check my kitchen before I got to the store. I only buy food for a couple meal at a time. Due to I have a small european fridge. That's pretty much how I shop too. I can't do the whole buy everything for a week at a time thing because I never know where I'm going to be throughout the week. 3rd times a charm...i can't beelive I did the same thing last night! and these printables are brilliant! I love this idea! I HATE getting home from the store and realizing I bought a duplicate! These are great! I will definitely be downloading and using these. 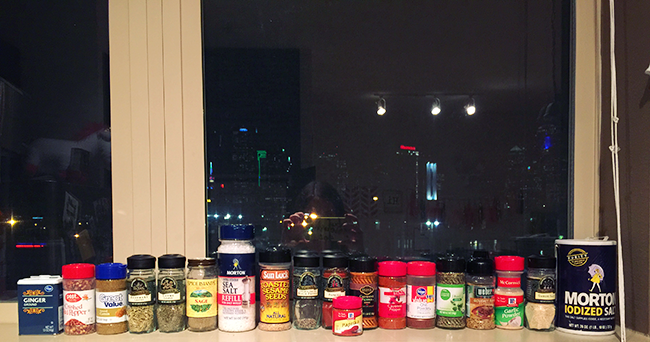 I have so many duplicate spices it's not even funny. Thanks! Genius. I genuinely hope this is the start of a series! This is such a good idea! I always end up buying stuff I already have at home because I can't keep up with what's already in the pantry. 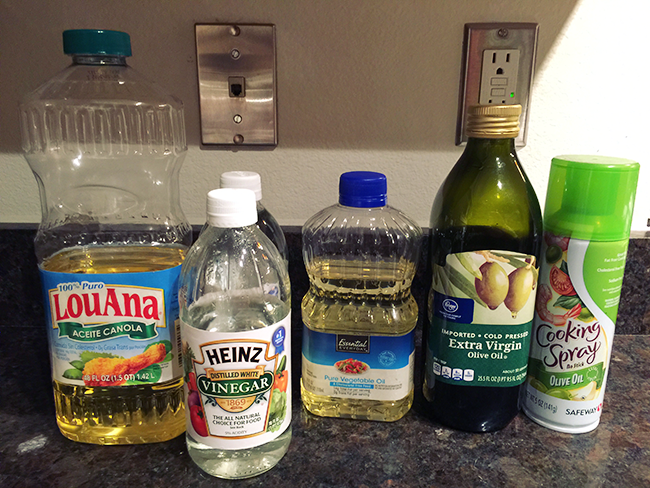 I mean, who needs three bottles of vinegar!? The more you cook & get a feel for the recipes you usually make & a good series of go to meals this will get better. I generally have a rule of thumb that if I'm considering a new weeknight recipe (aka relatively quick and easy to make) I won't even consider it if it contains a weird ingredient I don't keep on hand. The only time I make "special" recipes that would require a special trip to the grocery store for unusual ingredients are weekends or special occasions. This post is genius! I always overbuy. And these printables are soooo pretty :) Thank you! 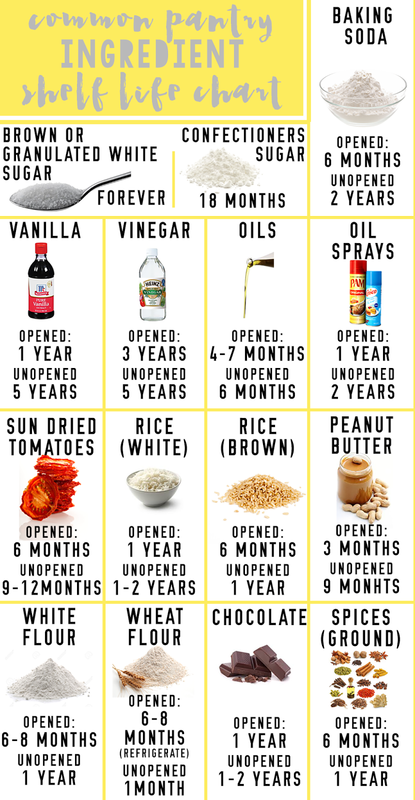 Printing this now and adding it to my recipe binder, this way I can make better shopping lists based on this ;) thanks!!! Love this printable! Totally using it. I realized not too long ago I have FIVE containers of cinnamon in my cabinet and each of them literally only had a dash out of it. Those lists are super cute and very helpful - thanks for your hard work! Awesome tips! But fyi, pure vanilla extract doesn't go bad if you store it correctly. Don't ever buy imitation, buy the good stuff & keep it. I actually stock up on great vanilla extract in Mexico every few years and it never goes bad on me! 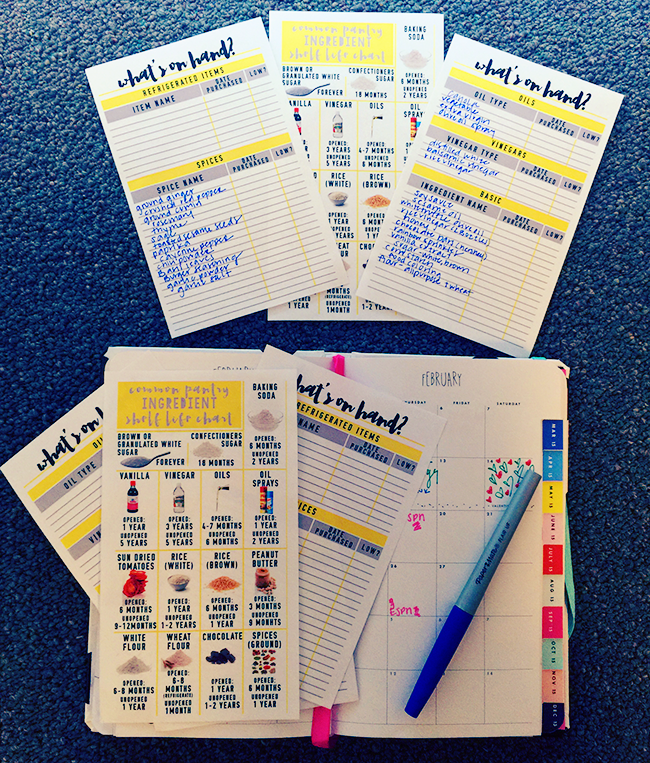 Thanks for the pretty printables!! Can't wait to start using them.